As always, a little spoiler space for those who haven’t seen the episode yet. Thankfully, this week, the choice of spoiler video is awesome. And now, on with… Kerblam! No observation on Bluey this week (I was out, and only just got back home in time for the ABC showing.) I somehow feel like this isn’t the complete Doctor Who 2018 experience somehow. Somebody want to fill me in on what I missed? So the opening intro is the section shown during Children In Need, which wasn’t entirely surprising. I’m still not sure how I feel about anything that can teleport inside the TARDIS, though. I get that it fits the narrative, but how does the technology work? How doesn’t it set off the security systems? Nice fez callback. Would have been even nicer if it was a stalk of celery, or for that matter a recorder. Kerblam! feels like the kind of place where Happiness Will Prevail. If you know what I mean. This is such a story that old Doctor Who couldn’t have done, simply because it’s such a post-Amazon story. Which also makes me wonder how well it will age over time. “Never, ever climb onto the conveyors”. Yeah, sure, I doubt that’s foreshadowing. Good callback to Ryan’s dyspraxia — I did wonder when I saw the episode teaser if they’d ignore it, but instead they noted how it takes him time to pick up physical tasks. This feels like a cheaper episode. I mean, the Kerblam! Man robots would have cost a little, but there’s a lot of standardised sets here, not much special. From what I’ve read around Amazon shipping warehouses, however, I get the feeling that the TARDIS crew is being worked a little slow. The pace there is, so I’ve read, much faster than at Kerblam! Lee Mack’s interaction with the Kerblam! Robot is, of course, a callback to some robots, and some death. Robots… of Death. Hey, I think I’ve heard that before somewhere. Whittaker’s Doctor does threatening well, but I perhaps could have used some setup for how she got in to make her complaint. Lots of those big businesses don’t exactly make it easy to get to the boss, after all. As someone who has their clumsy moments, I’m really starting to like Ryan. But still, I’m never going down any delivery chute if I can avoid it. And then seconds later, near death by high five, just as I’m wondering how universal the high five actually is. Twirly the v1 Kerblam Bot has clearly stolen some code from, well… this guy. In my professional capacity, I sometimes get mysterious boxes (usually a mix of product reviews, PR fluff and branded off-brand smarties) with my name on it. And from now on, I’m going to be concerned that opening it will lead my my liquidisation. Which, I feel sure, is a bad thing. That really WAS Robots of Death; a confined space (albeit a factory this time), a single villain, death at the hands of his creation, the whole lot. Although nobody threw hands at anyone. SHUT THE HELL UP ROVE. YOU’RE ACTIVELY MAKING ME AND MANY OTHERS NOT WANT TO WATCH WHOVIANS UNLESS THERE’S SOME KIND OF TRAGIC ACCIDENT. Yeah, well.. overall, I didn’t love that. 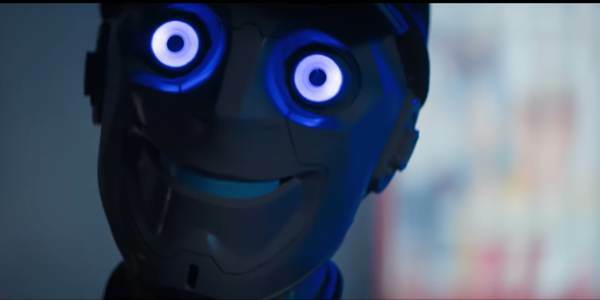 I mean, it’s Doctor Who, and I’m a fan and pretty much will be for life, so any Doctor Who is good, but I think I’ve got my new current low-end runner for favourite episode of the series. Because ultimately, that episode was just kind of there — and even with something of a “peril that threatens the entire world” sticker slapped onto it! Next time: The Witchfinders! Which totally sounds like it should be a Hartnell episode.